A handsome plant, with a very stout, branching stem and soft, bluish-green leaves, with silky hairs on the edges and under sides, forming a fine clump of foliage, from which the flower-stalks stand up very stiff and straight. The cluster is most symmetrical in form and the flowers, which are nearly three-quarters of an inch long, are a beautiful, pearly white, tinged with yellow at the base of the standard and with creamy buds. The lower lobe of the calyx is large and very dark green, the stems have a pale, satiny surface, sprinkled with hairs and the leaflets are ten or eleven in number. This grows in the grass along the roadsides and is common around San Bernardino. 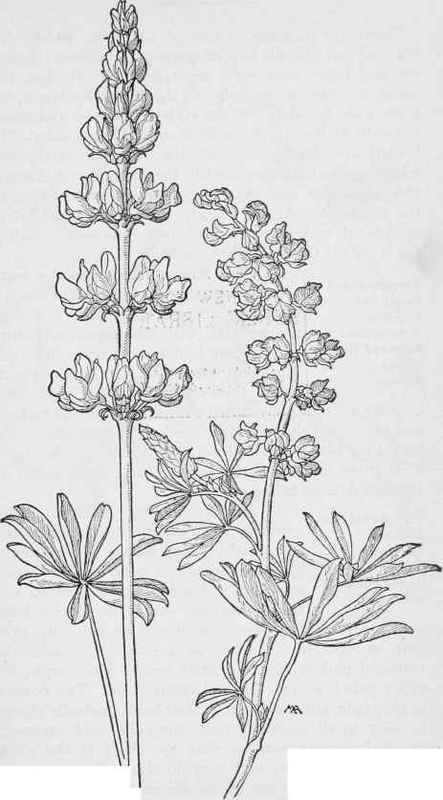 Milk-white Lupine Lupmus tacteus Quaker Bonnets-L.laxiflorus. PEA FAMILY. Fabaceae. There are numerous kinds of Lathyrus, widely distributed and difficult to distinguish. In technical character and habit they very much resemble Vetches, but sometimes have no tendrils and the flowers are larger, the leaflets are broader, and the style is flattened and hairy, not only at the tip, but also along the upper side. The leaflets are equal in number, the leaf-stalk usually terminating in a branching tendril; the flowers are in clusters; the calyx with five teeth, the upper commonly shorter; the style flattened and usually twisted; the pod flat or cylindrical, with no partitions between the seeds. Lathyrus is the old Greek name of the Pea.